Met on arrival and transferred to hotel. Take a city tour in afternoon covering Lalbagh Gardens and the Vidhan Soudha etc. Overnight at hotel. Set out for Mysore in the morning. Check into the hotel on arrival. Enjoy the sightseeing in the afternoon. Overnight at hotel. 0600hrs: Drive too Srirangapatnam, the horse safari base. Tea / coffee on arrival. 0730hrs: Safari starts and journey towards Rampuran, halting for breakfast. Pamper your senses with the visual delights of the rural Karnataka and get familiar to the traditions. 1030hrs: Proceed to Darasguppe. Take break for lunch and rest. 1400hrs: Resume safari and reach Rajanehalli by evening. Tea / coffee on arrival. 1800hrs: Head for the Brindavan Gardens. Visit the terraced garden, illuminated musical fountain. 2000 hrs: Return to Camp. Build campfire and have dinner. Musical performance by the locals. Overnight at camp. 0700 hrs: Morning Tea. Resume safari and journey towards Balmuri Fall. Breakfast on arrival. The waterfall is a breathtaking spectacle. 1000 hrs: After breakfast, proceed to Ranganthittu bird sanctuary. Do a round of the bird sanctuary, which is home to migratory birds including various bills, storks, white ibis, Little Egrests numerous Lunch break. Later proceed to Srirangapatnam. Morning drive to Madikeri. On arrival check into hotel and get refreshed. Madikeri for its picturesque beauty and comfortable climate is called Scotland of India. Explore the area visiting Madikeri Fort, Abbey Falls, Nisargadhama. Overnight at hotel. After breakfast at the hotel, drive to Hassan. Check into hotel on arrival. Rest of the day at leisure. Breakfast at the hotel and drive to Bangalore. En-route visit the statue of Gomteswar at Sravanbelagola. This one of the prime Jain pilgrimages in India. Evening free. Overnight at Bangalore hotel. 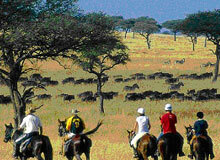 Indiaprofile.com offers online booking of Horse Safari Tours in Bangalore. To book a hotel or a tour package or for more information, please enter your query in the form Given.